Frans Johansson is relinquishing logic and harnessing the power of serendipity. In his internationally acclaimed works, The Medici Effect and The Click Moment, he provides extraordinary insight into the intersection – the serendipitous place where imagination, innovation and ingenuity coalesce. 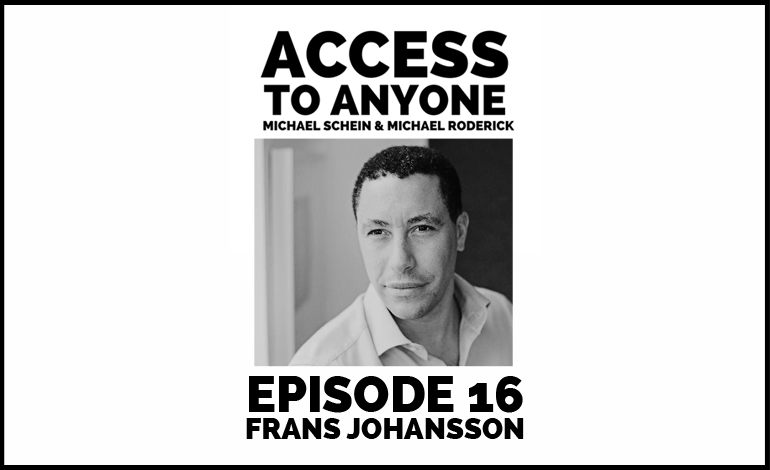 Today Frans discusses why embracing the random, seizing the unexpected, and immersing yourself in diversity are the driving forces behind connectivity and success. Why “weak ties” are a catalyst for serendipity. Embracing the true power of stepping away. How to leverage your network with spontaneity. Why you should indulge in activities outside your core business (and not feel guilty about it). Frans Johansson is a renowned author, entrepreneur, international keynote speaker, and the founder and CEO of The Medici Group. His debut book, The Medici Effect, was named one of the “Best Books on Innovation” by BusinessWeek, one of the top 10 best business books of the year by Amazon.com, and is now available in 18 languages. His acclaimed follow-up book, The Click Moment, rewrites the rules for success. Frans has advised Executive Leadership in the world’s largest companies, including BAE Systems, Caterpillar, MetLife and Nike, as well as startups, venture capital firms, government agencies, and universities around the world. He sits on the Diversity and Inclusion Board of Novartis, and has been featured on CNN, ABC, and CNBC among others. He has written articles on healthcare, information technology, and the science of sport fishing.